The wine that stole our hearts but not our wallet this week is from Shale Oak Winery in Paso Robles. 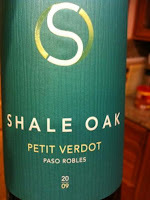 It is a lovely drop this 2009 Petit Verdot. Inviting on the nose with a sweetness of molasses and some vanilla, it falls on the palate with full flavors of dark fruits, cherries in particular, with some noticeable fine tannins with some oak to carry you off to the finish. A wine that is looking for some spicy nibbles to keep it company and make you smile. We give it a 6 and it is ***. A great wine to have with some zesty Italian or BBQ on any night of the week! Tasting Room is open 10am to 5pm, closed on Tuesdays and Wednesdays. We have been to the tasting room and this is what we had to say. Shale Oak Winery! Wine trends, low alcohol, who really cares? Walkabout 2012 D’Arenberg, McLaren Vale.